The Knicks and Nets will face off Thursday night in primetime, but viewers will not be getting two exciting teams in the East. Instead, they will be viewing two of the NBA’s worst teams. Brooklyn has a 5-13 record on the season and has struggled despite winning 49 games last season. New head coach Jason Kidd’s roster has been riddled with injuries and things heave clearly not gone as planned. Brooklyn has the second highest payroll in the league and desperately needs this roster to show signs of life. Paul Pierce, Deron Williams, and Jason Terry all remained sidelined while others players have missed time, including center Brook Lopez and forward Kevin Garnett. Their last game was a 111-87 loss against Denver on Tuesday. The Nets have been one of the worst home teams in the league, losing regularly by digit-digits in front of their home crowd. The same can be said for the Knicks, a team which is off to one of its worst starts at Madison Square Garden. New York is 1-7 at home this year and just 2-7 on the road, giving them a 3-13 mark on the year. The Knicks are coming off a game last night and are currently riding a horrid nine-game losing streak. They lost 103-99 to the New Orleans Pelicans this past Sunday, a game where they again failed to play well on their home floor. The loss was their seventh straight at home and lackluster effort defensively. 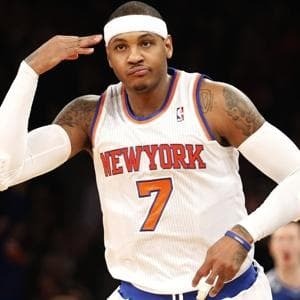 Carmelo Anthony scored 23 points in the loss and continues to be the lone bright spot for this franchise. Both of these teams seem hard to predict lately, other than the fact that they are usually going to be losing. One thing both have had issues with is defense. Since the loss of Tyson Chandler to injury, the Knicks have been a terrible defensive team inside, thanks to the likes of Andrea Bargnani patrolling the paint. Likewise, the Nets have getting blown out all season. I think this one easily clears the 190 mark, and these teams turn the game into a primetime shootout. Coming off their first loss in the past eleven games, the Heat head to the Windy City as they look to get back to their winning ways against the Bulls. Despite the loss, Miami are 14-4 on the year and are once again a powerhouse in the East. They faced the Bulls on opening night, winning 107-85 while shooting over 50 percent. Of course, these Bulls will be without point guard Derek Rose who will miss the rest of the season with injury. Miami lost on Tuesday to the Detroit Pistons at American Airlines Arena 107-97. Dwyane Wade was held out of that game and may miss tonight’s contest with knee soreness. Michael Beasley and LeBron James picked up the scoring slack in that game, each scoring 23 points but it was not enough against Detroit. After dealing with the loss of Derek Rose, the Bulls have played better as of late but are still not getting the results they want. They have shot just over 49 percent over their last three games. Still, they have won just one game since Rose went down with a knee injury on Nov. 22nd. Chicago went to triple-overtime with New Orleans on Monday but failed to come out with in a win the 131-128 affair. Luol Deng continues to assert himself as the primary scorer since Rose’s injury, scoring a season-high 37 points in the loss. One has to worry about the toll three overtime periods put on a player’s body, especially with the Heat coming to town after a loss. It seems unlikely they will lose two games in a row, but I love Chicago in this spot. Just in general, they match up well against the Heat with a strong frontline anchored by Noah and Boozer. Miami’s weakness is rebounding, and Chicago outclasses them here. Also, a hobbled or scratched Dwyane Wade is another thing going in the Bulls’ favor. The line seems fishy from the oddsmakers’ standpoint and they clearly like the Bulls to keep this one close at the United Centre. I am buying into it. Miami is not invincible as Detroit showed us this past Tuesday.